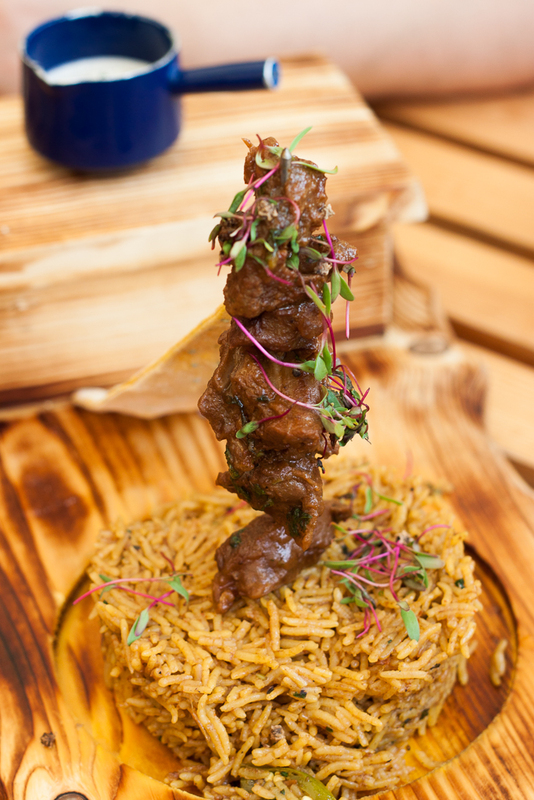 If you thought Farzi was already twisted, wait till you see the new additions to the menu! I love how this restaurant always manages to have fun with its food and not be bogged down by ‘authentic’ or ‘traditional’ combinations. Molecular Gastronomy, Modern Indian food, Artistic Plating and Gimmicky cutlery – not everything might work right off the bat, but it definitely gives your brain and your palate something to chew on. Ready for the Farzi Twist? I sure am and lip-smackingly so! Drinks are served in funky glasses with even funkier concoctions, but I always gravitate towards the Chai-Pani for it’s drama and surprisingly balanced taste. 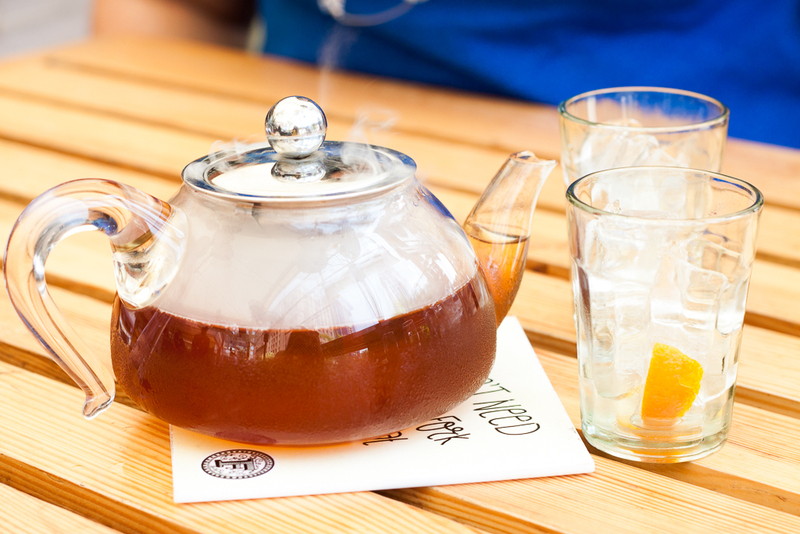 Literally translating to Tea-Water, this drink gives you a smoking drink in a glass kettle with Coffee Liquer, Tea decoction, Apple juice, Earl Grey Smoke and Vodka. The orange peels in your little chai glass make it even more refreshing! Definitely one of my favourite cocktails in Bangalore. The other drink on the table was a Bottle Ka Gin, served in … wait for it…. 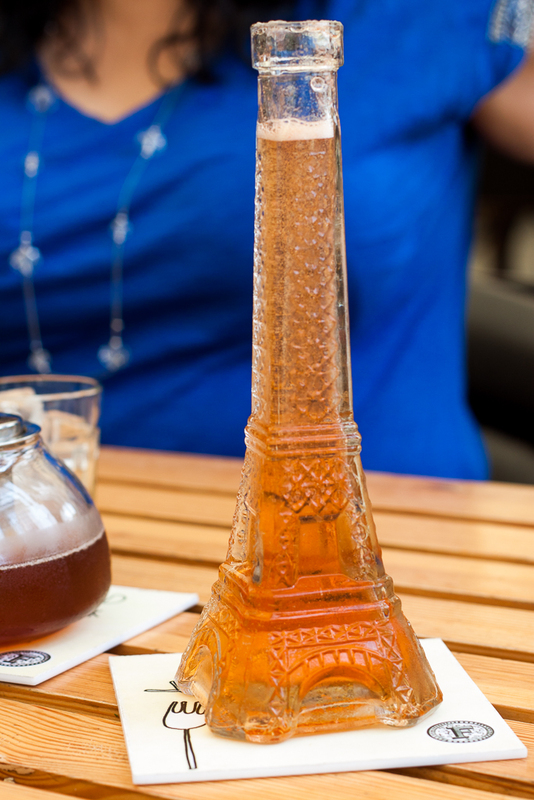 a bottle shaped like the Eiffel Tower! Gin, lime, vanilla, angostura bitters and cinnamon smoke topped with ginger ale make this a drink with complex flavours. What followed was an afternoon of food debauchery and I’m glad I had two of my compadres to partake in the feast. 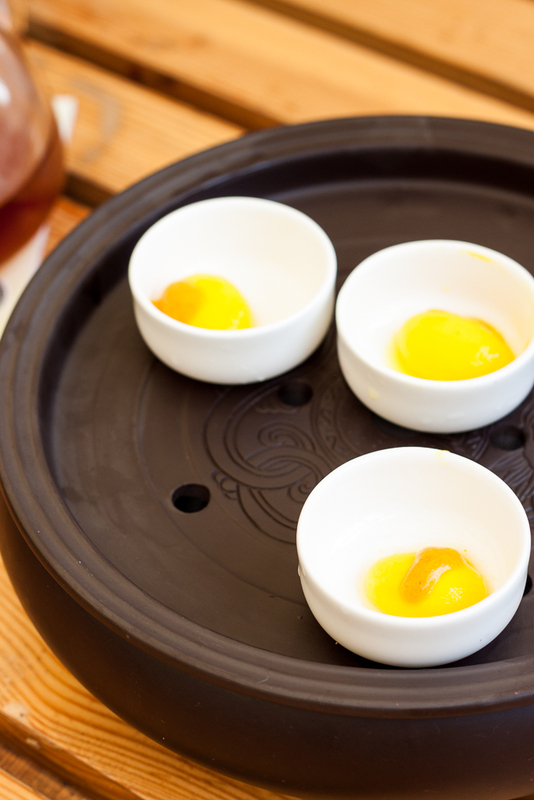 The Amuse Bouche consisted of a Spherification of Mango Yogurt with a mango sauce. Just a bust of summer on my tongue! I could easily polish off a dozen of these yolk-like beauties. We had a salad next. A Dhokla would probably not fit my idea of a salad, but I’m glad I tried the Dhokla and Farsan Salad with Seasonal greens and Tadka Chilli. 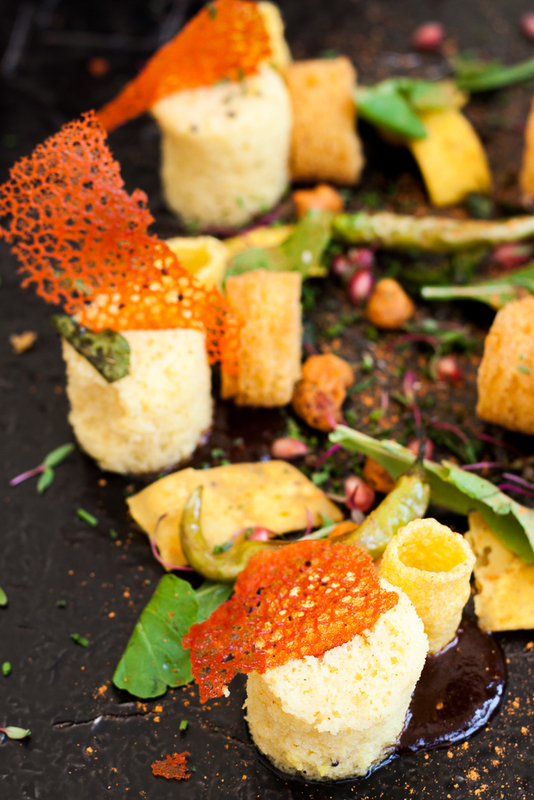 The dhokla was soft and spongy and the accompanying tangy chutneys made it a delight to eat. The plating reminded me of a mini fantasy garden and I’m definitely going to repeat this order. But again, not really a salad, because – Show me the greens! The Dal Moth Matka Chaat is something I would fully support, as a feature on the regular menu. 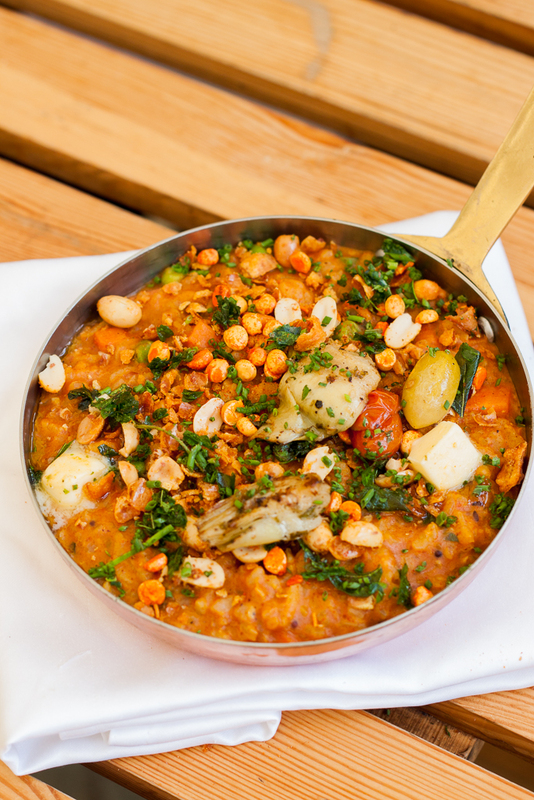 Perfect Delhi-style chaat with a much-loved lentil mixture like Dal Moth. The apple slices provided a crunchy tang and made our mouth water. The smoke from the plate was definitely unnecessary but I heard people from other tables gasp with surprise, so I’m thinking it probably works for most people. When the next appetizer arrived in a hollowed out rolling pin, I realized I just had to grin and bear the ‘creative’ cutlery. 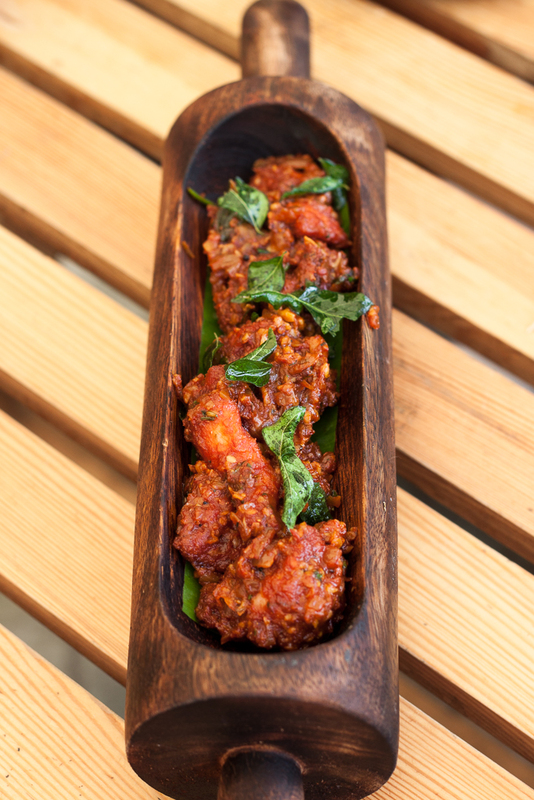 The dish inside however was a firecracker and did complete justice to the fieriness of the Guntur chilies of Andhra. This Chilli Chicken is a perfect accompaniment to beer and that’s exactly why our next round of drinks were a couple of KF’s. It’s a good thing we had our beers rolling in, because the Sion Prawn Koliwada demanded it as well. 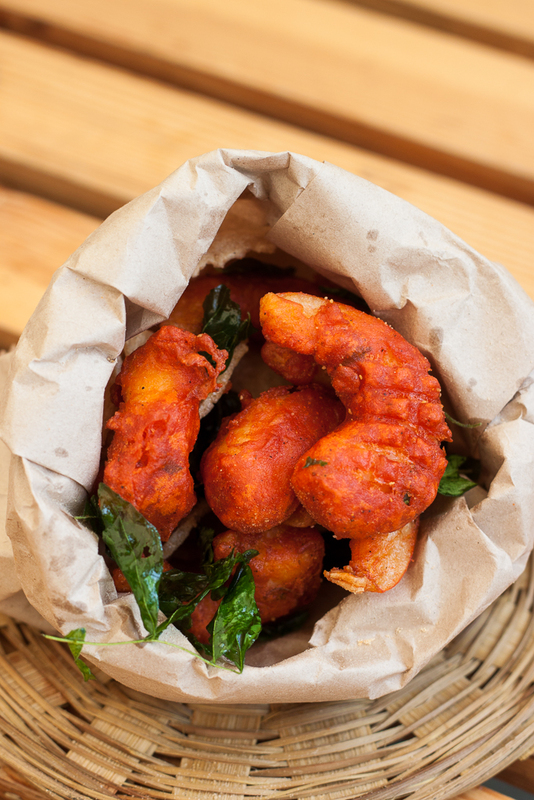 Batter fried prawns in a koliwada marinade from Maharashtra, sprinkled with pomegranate dust and curry leaves are the perfect bar snack. They threw in a couple of prawn crackers as well and we shamelessly competed to fish out the last one. The Mac and Cheese Parkora Bites made a grand entrance on the back of a cycle carriage, but needed more than that to save them from being relegated food at a kid’s birthday party. The Patti Samosas also fell in the same category though the chilli chicken filling scored over the tandoori soya chap one. 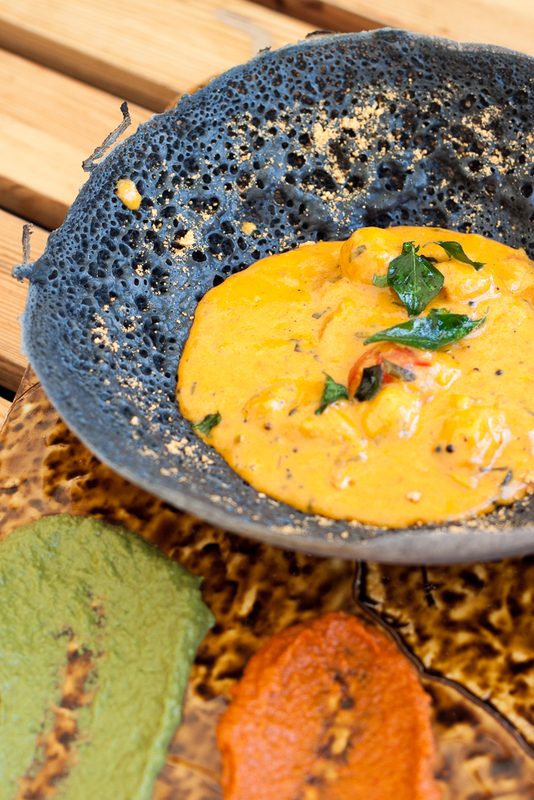 I always look forward to the charcoal colored Appam and the impeccable Bheja Fry it is served with. However, the twist menu introduced a veggie version with an Asparagus and Water Chestnut Kurma. The silky gravy provided a perfect bed for the crunchy water chestnuts and the fresh asparagus. The accompanying chutneys on the plate went well with the appam but definitely take the focus away from the kurma. Maybe we should omit these sly show stealers next time. The opinions on bastardizing our beloved Bisi Bele Bhaath were intense. The bhaat itself was executed like a risotto with Arborio rice, but they also added in charred artichokes and cherry tomatoes to give it a more tangy finish. Did I like it? – No. Did my friend like it? – Yes. Did a friend of my friend like it? – Yes. Did my husband like it – No. So you can see how this is probably a fence-sitter. I’ll let you form your own opinion. I wish I had saved some space for this completely audacious maincourse of Mutton Shawarma and Biryani. I mean, how do you take two awesome standout dishes and put them together in one plate and expect them not to overshadow each other? But guess what, Farzi did – and it totally worked! Reminded me of another experiment of a Biryani-Cheese-Burrito that worked as well. In hindsight, I think I’m just addicted to Biryani like 90% of Indians. It’s about time someone named it our National Dish, no? I expected Desserts to be theatrical. But they just came pretty on a plate, like they already knew how awesome they were and didn’t need to try too hard. 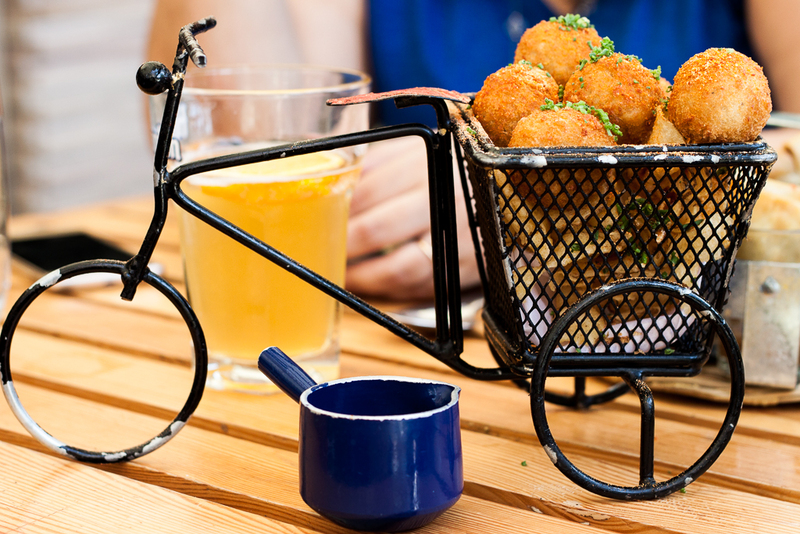 (Yes, I’m referring to the Mac and Cheese Balls here :P). The Ghewar Malai Tart could rival the ones that you get in quaint Mithai stores of Rajasthan. 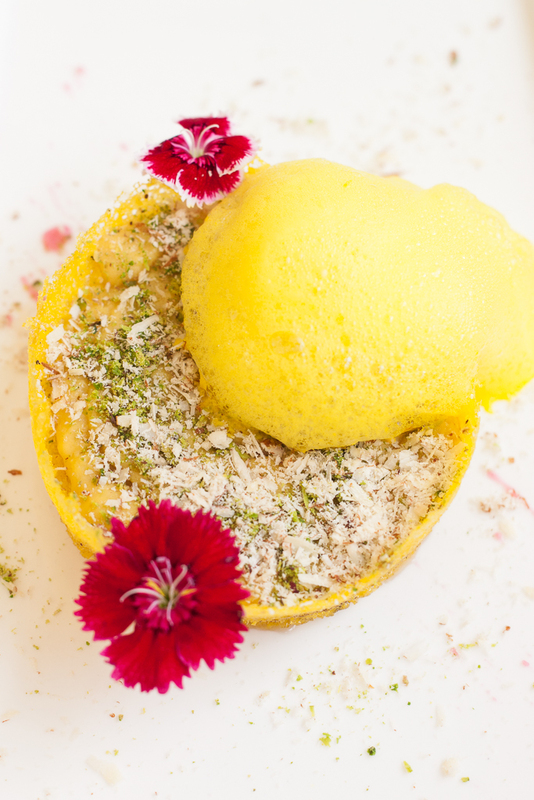 The saffron foam and Pistachio dust were a lovely addition and for once I can’t complain about tasteless bubbles covering my food! 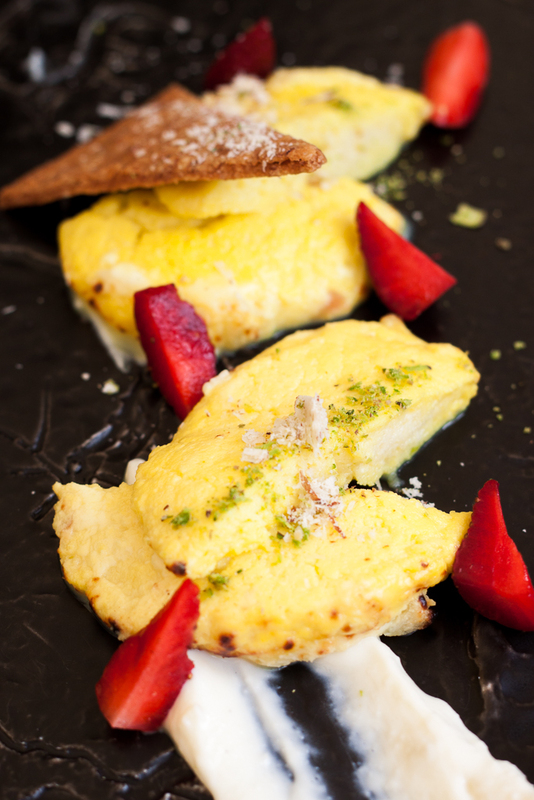 The best I saved for last – the Smoked Rasmalai with Rabri and Strawberries. It was too much goodness on one plate and I relished every indulgent bite. The new menu additions have many twists and turns, but overall the experiment has definitely resulted in some winners. I’d recommend a nice afternoon lunch to fully enjoy the colours and theatrics on your plate. But make sure you book a table in advance – the kitty party aunties seem to grab the best ones. Vittal Mallya Road, Lavelle Road, Bangalore.